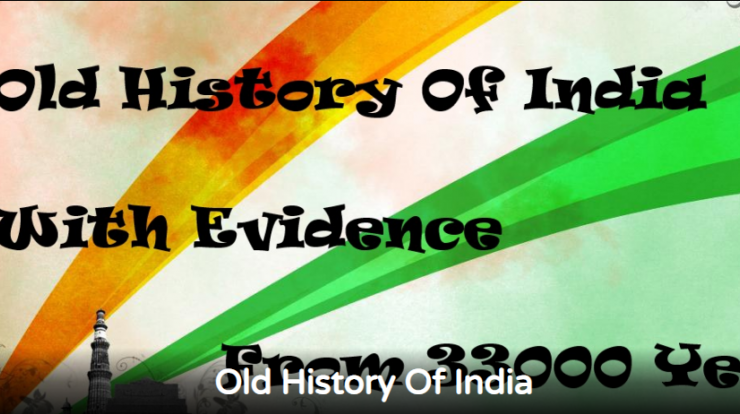 I am dividing History of India into different posts on the basis of year span, you readers can have structured and well maintain information about the old history of India. so, If you are an Indian then will definitely feel 1 feet up than other countries by reading about Indian cultures and kings. The meaning of homo erectus is that they are the first human who was standing upright human when their fossils have found, scientist have shocked with the different DNA of man. Homo erectus is the name came from the Latin language which usually means homo=man erectus= upright. In the earlier 15th century fossils are found near Africa, but in the 20th century because of the world wars, nearly any of them is safely kept. 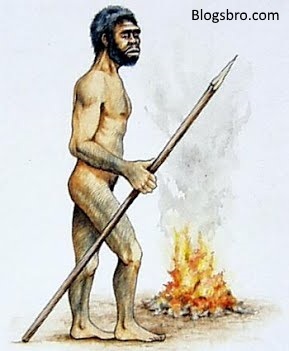 It was believed that homo erectus came first lived in Asia but later on due to the oldest fossil found in Africa scientist have convinced now that they were firstly lived in Africa. 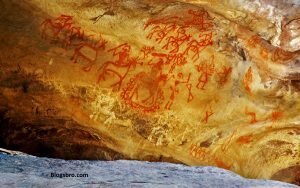 Due to the worlds oldest painting nearly 15000 years ago, found near the Narmada valley called as bhimabetaka painting, proved that homo erectus was living near the Narmada river which is now at Madhya Pradesh. Narmada river is popular in India for their handmade saries which indicates the beauty of Indian woman. It is believed that the culture of saris is invented here. Tools found here are stated nearly between 2 -5 million years ago. It is stated in the India Pakistan and Nepal. Near Rawal Pindi, many of the edged pebble tools found and near the Himachal Pradesh lots of cleavers and hand axes found. The word bhimbetaka pointing us to the meaning in Hindi “ sitting place of Bhim”. In Hinduism, there is a world huge poem MAHABHARAT which is available now worldwide and in nearly any language, Bhim is one of the 5 Pandava’s and as mentioned in the Mahabharata he is physically strongest Pandav. well if you need information about BHIM then You can comment below I will provide interesting history about him, and trust me there are lots of things to tell about bhim. In 1988 British named Kincaid mentioned bhimbetaka in his papers, he got this information from the civilians are staying nearby Bhopal. There are more than 750 rock shelters in that area. This painting is called as bhimbetaka painting, some kids are seem to playing and man on a horse with a weapon in his hand can be seen in this painting. In One of the paintings here, the handprint of a kid is found. Vishnu wakarkar found this cave while he is traveling by train, he jumped out of a slow train and targeted edakka cave. While studying the paintings he found that in the lots of painting horse is denoted with the human, and this thing made one thing clear that “Arab Didn’t bring the horse in India, horses are already from India”. Vishnu wakarkar is awarded by PADMASHRI from the Indian government. 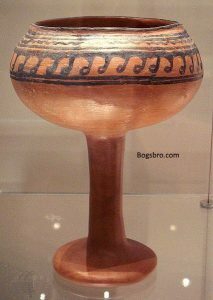 This civilization is formed between 3300-1700BCE and its one of the oldest and popular of 3 civilization in the world. This civilization developed near the Indus river, probably intention behind this is “easy supply of water”. 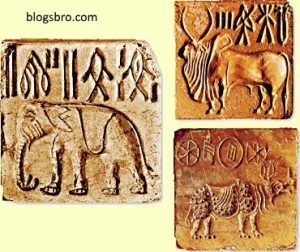 Mohenjo-Daro,lothal,dholaveera,rakhigadhia, and Harappa are the main center of this civilization. 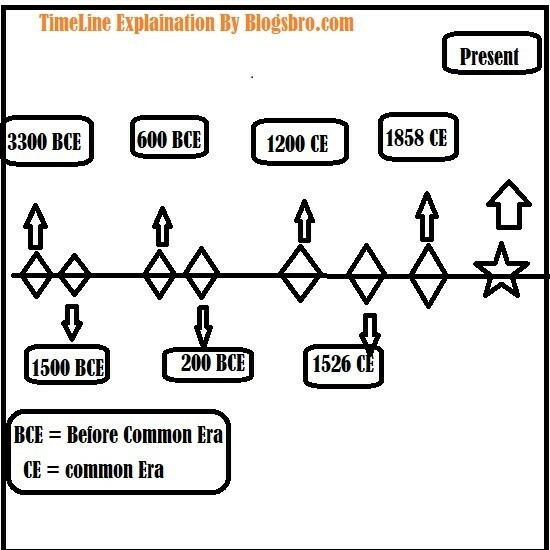 In the December 2014 bhirdana is decided oldest civilization.as per British scientist it was the most developed civilization so far.In 1921 Dayaram sahani Founded This civilization. This is the first time in the old history of india where bronze is invented and used in most of the daily life. Nearly 1400 centers are dug, among of that 925 centers are in India. A scientist has mentioned that till now only 3% of centers are being dug. It is well developed and firmly constructed civilization of all time. At the main center’s construction is of high quality and in the subcenter due to the common people civilization quality of construction differed. Kings used to live in a huge fort and other common level civils used to live in bricks home.The most popular place here is Mohenjo-Daro, which seems most developed In Harappa center. In the Mohenjo-Daro, we found huge water tanks, clothes changing rooms, storage rooms for food and in some places, grains found in the floor gaps that indicates farming in that time. There is no evidence of any of the king is found till now, but one is quite sure that, the kings here are very clever. There is much evidence found about 4 headed men, In the Mewar which is near the border of Indus valley, believed that it is the Lord eklingnath (Shiva) who also has 4 heads in lots of their paintings. The population was nearly 50000 but only 100 graves found and this shows that they used to burn dead bodies. In one of the Mohenjo-Daro house, 14 men fossils have found and that is pointing toward the possibility of attacks, epidemic or fire accident. This battle is mentioned in the Rigveda, and it took place between 1400-1300 BCE. This battle is between puru king (with the sage vishwamitra) and king Sudas (king of Bharata). The mentor of Puru is vishwamitra and mentor of sudas is vashishtha.In this war, King Sudas was won and won the whole area of the south which is later named as BHARAT. Main kingdoms of Janapada Era is Kuru,panchala,kosla,videha. This period is also called as iron age because in the Atharva Veda iron is mentioned as “syama ayas” which means black metal. At that time kuru state is the biggest of all state, so obviously, kings of kuru are the king of that era. There are the two main kings of the kuru parikshit and his son janamejaya. It is being said that in the Mahabharata poet, parikshit is the son of Abhimanyu, Abhimanyu is the son of Subhadra and Arjun, Arjun is the son of king Pandu, Pandu is the son of king vichitravirya, vichitravirya is the son of king Shantanu, Shantanu is the son of king kuru, kuru is the son of hasti, hasti is the son of Bharat. Mahabharat and Ramayan are the two poems which mean in Hinduism a lot. Mahabharat is the worlds biggest poem. A scientist has no clue whether this is just a poem or a real old history of india. But the main thing here is “It is the most thrilling story, you have ever read” if you know Mahabharata then you would agree with me. Ramayan which is another huge poem after Mahabharat but This two poems are interlinked each other, as per written in the Mahabharata, Ramayan is the story of ram which is happened before the Mahabharat. Many experts said that Mahabharat poem is 1000BCE old but due to the time elapsed in-between Mahabharat poem is changed decades by decades. In this period Sramana movement occurred, Sramana means the saint who is completely dedicated to Jain or Buddhism. Shramana has to follow five Mahavrutas – Sarvaprampam, Sarvmashrishnabad, Sarvadattanan, Sarvamatabhaban and Sarvaparagra Varanan from the mind, mind, and work. Upanishads are written in this periods, they are said to be the last of Vedas which is called the end of Vedas “vedant”. The meaning of word Upanishad is to seat near the guru and perceive all the knowledge about body and soul.There are 108 Upanishads each of them are based on Vedas. With the 500BCE so-called second urbanization started on the Ganga plain. During 600-300BCE there were 16 powerful kingdoms which are called as MAHAJANPADA. This whole era is strongly impacted by Sravana by Jain and Buddhism. From above-mentioned kingdoms there are lots of kingdoms are mentioned in Mahabharata poem, for example, Karna is the king of Anga kingdom, Shri Krishna is from Mathura, Gandhara and Shakuni is from gandhar, Kauravas are from kuru. In the 600BCE licchavis is the cast of the people who are known as great warrior and rulers. Licchavi’s ruled the whole century, they used to live at the Vaishali Nagar which is near mujjafur Nagar at Bihar. It is being said that due to the great legend named “Licha” , his family tree is called as lichhavis. They ruled on Nepal, magadh, and Kaushal. In the old Sanskrit books, licchavi’s are mentioned as Kshatriya which means great warriors and kings. They are against Vedic cast. They are divided into lots of branches. One of them branch vaishalivali is the origin of Mahavir swami who is the god in Jain, and in the Kaushal branch lord, Gautam Buddha is born. This is the century where there is a huge influence of Gautam Buddha, even lichhavis are also deeply influenced by lord Gautam Buddha. Gautam Buddha associated with these four kingdoms in his life and that are, vatsa, Avanti, and Magadha. Impact of the Sravana on this era people forced them to form Sravana religion. The life cycle of birth and death is being focused at this time. Gautam Buddha and Mahavira are the two lords who founded their own way to follow the humanity. Yes, they were from the same era. 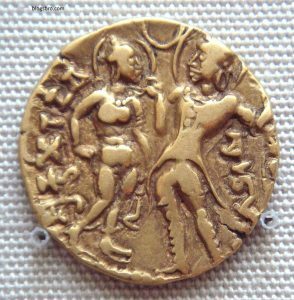 This coin is 350CE old , the print of king chandragupta I and queen kumaradevi is mentioned. Mahavira is one of the 24 Tirthankara. Tirthankar is a word used for that 24 legends who through their own tenacity and receive enlightenment. In short, those who create a shrine crossing the Sansar, they are called Tirthankaras. Lets study who are the Tirthankara. According to the Jainism, there is no end of time, time walks like carriage pan, our current era has been the first infinite number of time cycles and even after this era there will be an infinite number of cycles in an upcoming era too. At the beginning of the 21st century, we are in the fifth round of the current half cycle of 2530 years approx. Gautam Buddha(563-486 BCE) is the former of Buddhism, he is most intelligent and socialist world has ever known. Dhammachakra Parivartan – Buddha gave percept to 5 Bramhins at Uttar Pradesh this event is called as Dhammachakra Parivartan. In 483 BCE at the age of 80, Gautam Buddha Mahaparinirvana took place at Kushinagar, Bihar. This kingdom was the main focus of Hinduism, and Buddhism history. Two of the greatest empire Maurya and Gupta were originated from here. This period of time is called as the golden period of India because at this time mathematics, philosophy, and astronomy. In 520 BCE Persian king Cyrus the great conquer Indian south part and ruled this area for about 200 years till 327 BCE. At this time Takshashila was the center of Persian rule for Vedic and Iranian studies are mixed with each other.This 200 years of Persian rule ended with Alexander the Great conquered Persia in 327 BCE. The story of Alexander the great. Alexander gifted him, 200 silver coins, 3000 bulls, 10000 sheep and 30 elephants. Ambhi played fare game while surrendering to Alexander and indirectly he made the battle between Alexander and Porus. Porus decides to attack Alexander and there is nobody to help porus, all of the kings were surrendered to Alexander. Due to the heavy pride porus decides to fight till the end. He reached the hydaspes(zelum river). Alexander’s army was shocked by seeing porus army formation, it was nearly impossible to drill rock solid army formation filled with horses elephants and an army of Porus. Hydaspes river had a huge flood at 326 BCE due to that porus and Alexander army was in front of each other but didn’t touch each other until months. One night when the heavy rain occurred, alexander commander’s found a small bridge to cross the river, nearly 11000 armies crossed a river and attacked porus army in the night. When porus alarmed about this he sent his son with 2000 army to attack Alexander army but his son died on the field. Porus was still unbreakable he continues the war and unfortunately caught by Alexander commanders. Alexander asked Porus ” how should I behave with you” then porus replied “like a king behaves with a king”, Alexander loved his answer and gave his kingdom back to porus. After this Alexander turned to attack Magadha who’s king is Nanda empire. Due to the tired army of Alexander and by seeing the amount of potential of Nanda empire Alexander decides to return from India. this coin is 322 BCE old . 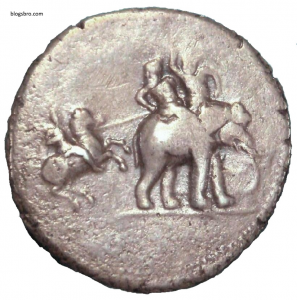 on this coin alexander the great is attacking king porus in indian subcontinent. This coin is known as victory coin. This is the empire of India which nearly covers complete India. so, if u heard about Maurya empire, then you must have heard about Chandragupta Maurya and Chanakya (Kautilya). We will discuss here their interesting story, how the Chanakya removed Nanda dynasty without using any of the physical weapons. Chanakya is the son of a teacher chanak who is living in a patliputra. Due to criticization on Nand dynasty, he got imprisoned by king nand and chanak is died imprisoned. Chanakya in young age moved to takshashila. There on chanakya did the deep study on politics and economics. Chanakya becomes one of the experts of that time in politics. He started teaching and his one of the student is Chandragupta maurya. Chanakya only had one dream in his mind ie. To remove nanda dynasty. When Alexander was planning to attack India then Chanakya suggested king ambhi to a reunion with porus and fight with Alexander, but porus was defeated by Alexander and he is now marching towards the Magadha. chanakya was very cured about Magadha and he went to king nand to consult about Alexander attacks, but instead of this, nand insulted chanakya hence the moto of the destruction of nand dynasty is being confirmed by Chanakya. He motivated his students about greeks and king Nand . after some years his students attacked greek small centers and destroyed them slowly. In all of this, the intelligence and skills of Chandragupta Maurya shined like a crystal. yet, Chanakya ordered Chandragupta to attack greek centers but leave Indian soldiers, while doing this greeks lost their trust on their Indian soldiers and Indian soldiers are mixed in the Chandragupta army. After destroying greeks Chanakya told Chandragupta to attack ambhi, thus ambhi was the opponent of porus, porus started supporting Chandragupta. Chandragupta has a huge force now and support of porus, using all of his strength he attacked Magadha and ended nand dynasty. This is how Chandragupta formed a Maurya empire. Bindusara who is the son of Chandragupta succeeded Maurya empire from 297-272 BCE. After the death of Bindusara his son, Ashoka succeeded Maurya empire. He ruled for 37 years until his death at 232BCE. In the battle against Kalinga, he destroyed kallinga. Due to the loss of life of huge amount of soldiers Ashoka felt embarrassed and he started following Buddhism. Brihadratha is killed by his commander pushyamitra shunga while, at the army parade. Brihadratha is the weak ruler and pushyamitra took good advantage of it and formed shunga empire. Maurya empire was the great empire especially Chandragupta and Ashoka. It is being said that Ashoka formed a secret community of expert people in a particular field.